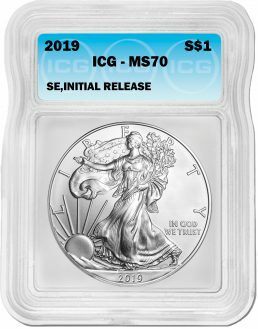 ICG is now offering Initial Release designations for select US Mint issued coins that are received by ICG within the first 30 days of the initial release of the new coin issue. If you are unsure if your coin will meet the requirements for the Initial Release designation, feel free to contact us. Eligibility for the Initial Release designation is determined by ICG staff and some coins may not qualify. If you wish to have a coin designated with the Initial Release designation, you must indicate so on the ICG Submission Form in the “Attribution/Variety” field. Attribution fees will apply.